There will be a John Flynn Placement Program Information Session at 6pm Wednesday 6 March at South 1, Building 64 Lecture Theatre. This is a chance to look at obtaining first hand experience through placements in rural and remote locations on the diverse and exciting world of rural general practice, rural communities and lifestyles on a scholarship program. John Flynn was the founder of the world's first flying doctor service that has continued to service remote Australian communities for more than 70 years. John Flynn Scholarships were established in 1997 and are awarded yearly to successful applicants. There will be pizzas afterwards in the foyer. Be in to win an iPad Mini!! Signing up takes just two minutes! 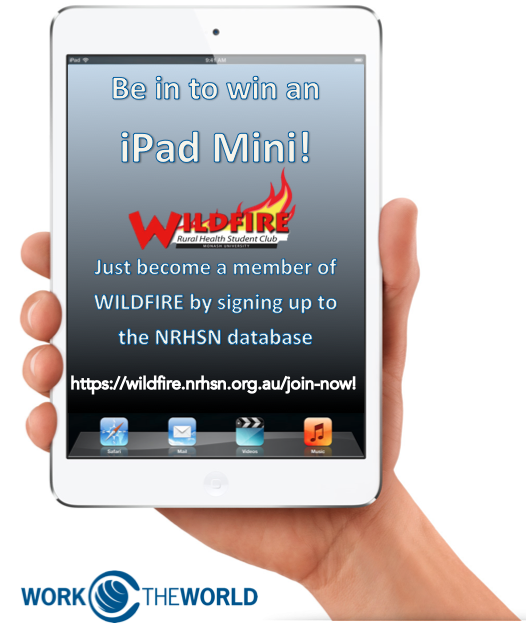 Sign up to become a Wildfire Member by entering your details onto our database with the NRHSN (National Rural Health Students Network). You need to do this even if you signed up on paper in O-Week. Your membership gives you loads of benefits including things like conference funding, great events and clinical skills sessions. By signing up, you also help Wildfire get funding from the NRHSN. Give Them Wings Scholarship Now Open! The scholarships support students from country Victoria in the first year of their university health studies. Two nursing and two allied health scholarships are being awarded in 2013, with each recipient receiving $2,500 towards their living expenses as well as a Royal Flying Doctor experience. 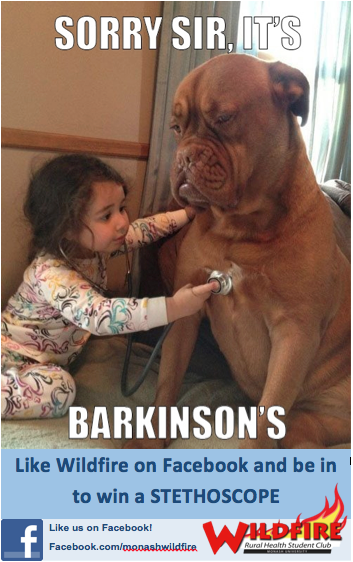 LIKE WILDFIRE ON FB, WIN A STETHOSCOPE! The Macpherson Smith Rural Foundation (MSRF) supports young rural Victorians in their desire to attend university. As you know going to university is a big step and moving away from home can be challenging. Having a mentor can be a way of providing support in a low key way. Being a mentor can give you an opportunity to help another person, develop new skills and make new connections. We are in the process of developing a 'mentor bank' or list of people who would consider being a mentor for a first year university student. The mentoring would involve an initial meeting and short training session and then monthly contact in whatever mode suits mentor and mentee. Both work together to decide what type of support or help is required. MSRF likes to use technology as much as possible to make communication easy and to reduce our running costs and environmental impact. If mentors or mentees are based in rural or regional areas training can be provided online or we may visit you. We are very keen to match you with a person starting university this year and would be delighted if you would consider becoming a mentor. Applications are now open for funding to attend the National Rural Health Conference Adelaide, 7th-10th April 2013! Every second year the National Rural Health Conference brings together consumers and a range of professionals to check progress and hear reports from across rural and remote areas. It is an opportunity for the voice of the rural and remote health sector to be heard in mainstream media outlets and the corridors of power at federal, state and territory level. On Monday 2nd of April, WILDFIRE Clayton Sub-committee, held the event ‘Get Plastered’ at Dooley’s Irish Bar. The event was mainly aimed for 1st and 2nd year medical students of Monash University and approximately 80 WILDFIRE members attended along with countless other Monash University stu- dents from a variety of faculties. The event ran from 6pm through to the closure of the ￼venue at midnight. Everyone had a free drink (basic spirit, schooner of beer or can of cider) and free hot finger food, as well as the opportunity to get their arm plastered or plaster a friends arm. People got fairly inventive as the night went on, even plastering cups to their hands! Get plastered ran concurrently with a table tennis competition which caught the attention of a lot of the attendees, especially one of our very competitive co-presidents! Overall, the venue was very cooperative and the night ran with- out any dramas, and reports suggest the night was definitely enjoyed. This March, WILDFIRE Mildura had a great time raising awareness for Oxfam’s Close the Gap campaign. Close the Gap is a national program aiming to achieve health equality for Indigenous Australians within a generation. The federal government’s financial commitment to the project expires in 2013, making it more crucial than ever that Australians continue to show their support. Our week (19th-23rd March) of activities began on Monday with committee members tagging the Mildura Base Hospital with Close the Gap posters and balloons. But this was only a taste of what was to come! On Wednesday, the third years gathered to watch a DVD on the Close the Gap campaign, followed by a yummy morning tea provided by the Mildura Regional Clinical School. We also got a production line going making pins to be distributed on Close the Gap Day (Thursday), closely overlooked by Kavya & Emma who had given up their Sunday to engineer our badge design! On Thursday, WILDFIRE had a stall and display set up in the main foyer of the hospital. Students spent the day explaining the Close the Gap campaign to hospital staff & visitors, handing out pins and encouraging people to sign the pledge forms showing support for the initiative. Caitlin had done an amazing job collating information on local health services available to Aboriginal & Torres Strait Islander people, which we also displayed at the stall. By midday, over 100 pins had been distributed and were seen all over the hospital, from the canteen staff to the consultants! This day was a resounding success, as most of the people we spoke to hadn’t known what Close the Gap was about. Big thanks go to all the 3rd years and Amber & Hieu (5th yr) for manning the stall and making the badges. Well done everyone for a fantastic week! Originally a London based initiative on Thursday 1st and again on the 15th March WILDFIRE laid their claim to the Teddy Bear Hospital and laid claim we did. Essentially WILDFIRE took 25 Medical students from both Monash and Melbourne University to Camp Hill Primary school in Bendigo and ran activities wither the grade 1 and 2 classes to alleviate some of the trepidations they may have and about the medical profession and hospitals. The day was a success, enjoyed greatly by the students, primary and medical alike. Some of the stations we ran involved showing the kids what happens when you get an X-ray done (with an X-ray of a teddy provided by Bendigo Health), plastering, what asthma is and calling the ambulance and surgery (with a specially designed surgical teddy who had a zip on his front so the kids could open him up and remove the pen he had swallowed). All the kids enjoyed all the stations and loved Dr. Teddy who took time out of his busy day of consulting to pop his head in and see how everyone was going. With two Teddy Bear Hospitals run already this year and at least two more planned I feel the Teddy Bear Hospital will be something that WILDFIRE will continue to be part of in future years as it a great initiative and I am proud of all involved and urge all those who have even the slightest interest in being part of one to contact me for more information. And for those who aren’t interested just be part of one anyway, I guarantee you will love it or your money back. WILDFIRE Mildura has kicked off the year in relaxed country style, with students from years 3-5, both undergrad & post-grad, coming together for a meal at Stefano’s legendary pizza café. For some it was a chance to meet and greet their fellow students for the first time. After a delicious meal, the herd migrated up the street to the Mildura Brewery, where we caught a rare glimpse of some of the registrars outside of the hospital! A great night was had by all and it’s certainly shaping up to be an exciting year in Mildura with such a great group of people.